No-one wants to think about the possibility of a life-threatening situation arising at their property, such as a fire or other emergency that might require the occupants to have to leave in a hurry. However, responsible landlords will need to plan for all eventualities to ensure that no harm comes to their tenants. In a dangerous situation, a system of emergency lighting could make all the difference to tenants being able to escape in good time. Hamilton King, a specialist property maintenance company which manages residential apartments from new builds to period properties, explains more about emergency lighting and how to make sure that it is properly maintained so that it is effective when needed. Regulations came into force in 2006 which gave the ‘responsible person’ who is in control of commercial premises and the communal areas of a House of Multiple Occupancy (HMO) the duty of keeping everyone in the building safe. The duty applies whether the people are working in the building, visiting or living there. This duty of care includes providing appropriate emergency lighting. Regulations state that emergency routes and exits which need to be lit must be provided with emergency lighting of sufficient brightness in the case of failure of the normal lighting. Which Properties Need Emergency Lighting? Generally, a property could benefit from an emergency lighting system if the escape routes are long and the building’s design is complex, if there is no natural or borrowed lighting along the escape route and if the occupants are vulnerable. ‘Borrowed light’ means light coming from a source which could be considered reliable, such as street lighting. For houses of multiple occupancy of four storeys, emergency lighting may be appropriate if the escape route is complex; for HMOs of five or six storeys, emergency lighting is strongly recommended. The obvious purpose of emergency lighting is for it to come on when there is a power outage, so an emergency light needs a battery or generator to give it an independent source of power. The first emergency lights were incandescent light bulbs which only provided dim light and gave barely enough light to see to repair the power problem or evacuate the building’s inhabitants. Better systems were soon developed, and a modern emergency floodlight gives good illumination in the form of high-lumen light. Many modern lights are halogen, and now that they have evolved to require a far lower wattage, and because battery technology has improved, they no longer require the huge battery packs that had made installations problematic. Nowadays, the newer emergency lighting systems consist of clusters of LED lights which require very little energy and emit little heat. They also have reflectors which intensify the light and allow it to be pointed in a useful direction. A modern system will automatically switch itself on if the main power fails, and can only be switched off manually. How Should Emergency Lighting Be Maintained? All emergency lighting systems should be regularly tested and inspected to make sure that they will work correctly if they are needed. Some landlords make the mistake of regarding emergency lighting systems as ‘fit and forget’ – if the system is not correctly maintained, then it may have developed a hidden fault, meaning that it gives a false sense of security as it will not work in a crisis. It is better to arrange regular maintenance than to be let down by the system, putting the lives of the building’s occupants at risk. Most landlords are not experts in electrical installations, and therefore may wish to outsource the maintenance of the emergency lighting to a professional. Sometimes, the emergency lighting system might be powered by a central battery that needs specialist maintenance; apart from this, most systems can be adequately maintained by competent electrical contractors. All emergency lighting systems are fitted with test switches – usually in hard to reach locations to prevent them from being tampered with. They are also fitted in such a way that the main power will not be left disconnected by accident. The function of the test switch is to simulate a power failure, to see whether the emergency lighting will be triggered into action. Some modern systems even have automated testing systems which ensure that the emergency lighting complies with the requirements of the various European and UK safety standards. All emergency light fittings should also be periodically inspected to check that they are clean, undamaged and not blackened and they should be replaced as required. A certificate should be issued when routine maintenance and testing has been carried out. 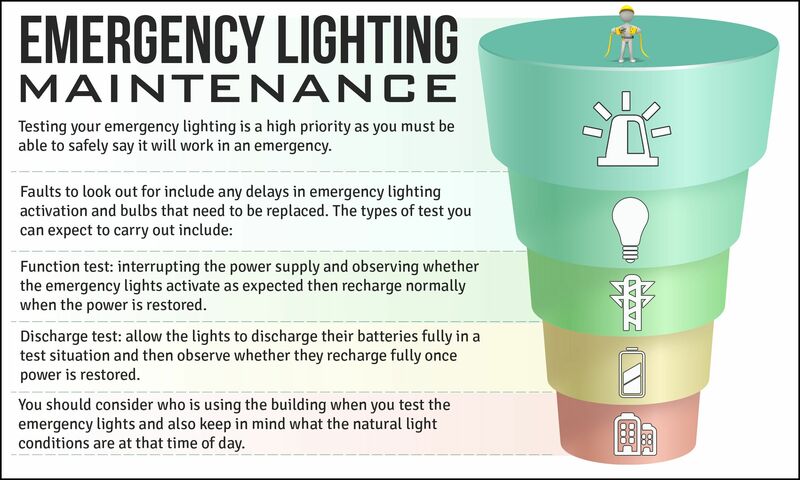 A landlord may carry out periodic electrical testing of their properties as a matter of course, and scheduling emergency lighting maintenance to be carried out at the same time will involve little extra effort or outlay, but could prove invaluable in the event of an emergency.